A elegant Key charm necklace holds a Victorian inspired drawing of the Queen of Hearts from Alice in Wonderland with all of her evil subtleties. This delightful charm necklace is adorned with Wonderland inspired charms of the White Rabbit and a clock. 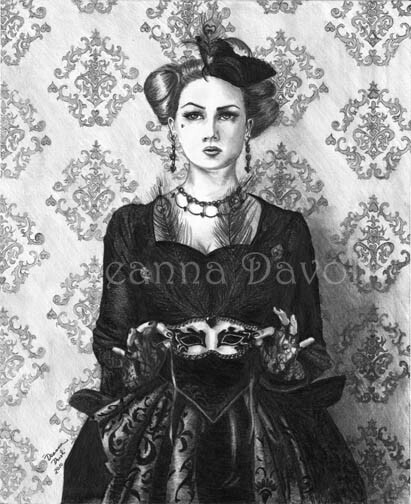 The Queen is set in Victorian style environment and is wicked to the core under all of the jewels and lace. Her mask is her charming disguise to the world who may think she is kind and sweet. * Flanked by 2 complimenting Wonderland inspired charms (photo shows a White Rabbit charm and a time piece charm). More charms are available per request.